Jingle while you walk, these anklets will get you attention every step of the way! 9 inches in length. Ball-and-loop adjustable closure. 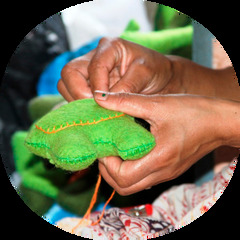 Global Groove is a fair trade organization working with women by supporting and developing artisan co-ops in Thailand and Nepal. The Fair Trade industry is expanding and we are proud to be a part of a sustainable movement that is changing lives. We design, develop, produce and source fairly traded lifestyle products with a commitment to the sustainability of production and the cultural heritage of the groups that we work with. We inhale its people, its landscapes, its colors, its flavors, its very scent, and we exhale to create inspirational products symbolic of our traveling experiences. Global Groove encourages travel because the knowledge, acceptance and understanding of different ways, people and ideas is the very colorful road to a respectful, safer, kinder world.